The first report from this study described key aspects of participating schools’ approaches to promoting deeper learning—that is, what adults in network schools did to develop deeper learning competencies. In this report—the second in a series—the authors focus specifically on the opportunities that students experienced to engage in deeper learning in their classrooms. In other words, the key question is, "Did students who attended the selected network schools experience more opportunities to engage in deeper learning than would likely have been the case had they not attended the network schools?" On average, students who attended the network schools in the study reported greater opportunities to engage in deeper learning than did similar students who attended non-network schools. These differences in opportunities were observed among schools serving diverse student populations, including substantial subgroups of traditionally underserved students. The effects of attending a participating network school on deeper learning opportunities were similarly positive for subgroups of students including initially high- and low-achievers and students who did or did not qualify for free or reduced price lunch. 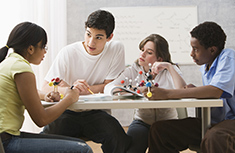 Teachers’ most challenging assignments collected from the network schools exhibited greater opportunities for independent learning in mathematics and real-world connections in English Language Arts than the challenging assignments collected from the non-network schools, but were not significantly different on other opportunity measures (including complex problem solving, communication, and conceptual understanding in mathematics). The opportunities for deeper learning experienced by individual students, regardless of whether they attended a network school, were associated with those students’ deeper learning outcomes. Providing Opportunities for Deeper Learning by Catherine Bitter is licensed under a Creative Commons Attribution-NonCommercial-NoDerivatives 4.0 International License.